Whether you’re an athlete, regular gym goer or a stay-at-home mom who likes to be fit, protein is an essential part of the diet. Health advice is not very difficult to come by and most people around you will have some nuggets or tips about food that according to them will turn you into a demigod. If you’re an athlete, more than less likely you have a fitness coach who gives you sound advice about the right food sources for your quintessential protein supplement. But what about those who don’t have a coach or trainer, for them it gets difficult to sift through the mindless cornucopia of babbling advices about which protein sources are best. Most often plant based proteins and equivalent supplements are overlooked for their meaty counterparts. While a well-balanced diet including animal based proteins helps, plants can be a holistic source. This article uncovers some of the lousy advice about plant based proteins. While much research has gone into proving the above point, most famously first in the 1971 book “Diet for a Small Planet” by Frances Moore Lappe, no satisfactory evidence has been documented. Of the 22 amino acids the human body requires, 9 can’t be manufactured by the body and thus need to be consumed from external sources .The proteins available in plant based foods can build the required amino acids for the body. Take legumes and lentils for example, 1 cup of lentils provide 18 gms of protein which is as much as six full egg whites. All forms of protein contain all protein forming amino acids. So if you eat a nutrient rich diet full of lentils, legumes, nuts, seeds and veggies you automatically intake the ingredients required to give you complete nutrition. There are only a couple of reasons why someone may not be able to complete their daily protein intake 1) Eating junk food that does not contain enough protein or 2) Consuming healthy food but not consuming enough quantity to fulfil their daily need. 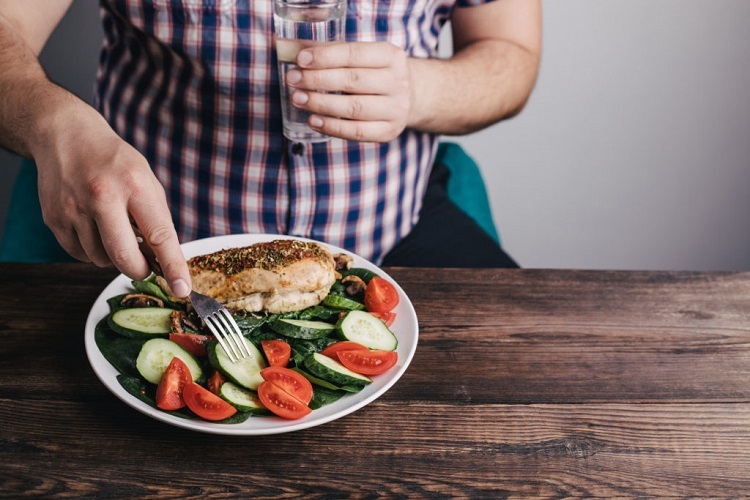 According to the National Health Service (NHS) UK , the total amount of calories required for maintaining muscle mass and body weight is about 2500 calories a day for males and about 2000 calories a day for females which is easily consumable with either 3 large meals or 5 smaller portions a day. The challenge is with consuming foods that are rich in protein. The daily consumption should contain 10 -20% of protein which is also easily achievable with a plant based diet. Another way to measure the amount of protein required is to calculate it as “total body weight” = “total grams of protein” i.e. 1kg = 1gm.It is difficult to meet the requirement for people who consume only salads since the intake is not varied enough and most times it is not sufficient. Daily intake should contain a range of nutritional foods like legumes, nuts, seeds, fruits and vegetables in good quantity. Today there is a range of plant-based protein powders that will help you get the protein intake you need from plants! Still doubting? Go through these 4 Myths About Plant-Based Proteins. You’ve likely been advised at some point in your health centric lifestyle that potatoes are bad carbohydrates, especially if you’re planning on losing weight. While some part of that advice is true, building it into a stereotype and painting the entire plant based diet with the same brush is incorrect. There are bad and good carbohydrates. Bad carbohydrates are foods like sodas, chocolates, pies and cakes which are simple carbohydrates that the body dissolves quickly. These carbohydrates are the cause of high sugar levels that cause lethargy, diabetes, heart diseases etc. Good carbohydrates are complex carbohydrates derived from sources like whole oat meal, corn, and fruits etc which take longer for the body to dissolve and thus become a source of sustainable consistent energy. While proteins are the essential building blocks for muscle, skin, bone, hair and even nails, we need carbohydrates to run the energy supply for the day. Good carbohydrates are also high in naturally occurring fibre, which helps lower not only blood sugar and insulin levels but also LDL bad cholesterol. Potatoes are complex carbohydrates although dissolve in the body as simple carbohydrates thus the misconceptions. While some quantity is good, a large amount can be harmful however ‘baked potato’ is always better than ‘French fries’.